GPAT 2019: The National Testing Agency (NTA) conducted the exam. The National Testing Agency (NTA) successfully conducted GPAT 2019 on January 28, 2019, from 2:30 pm to 5:30 pm. 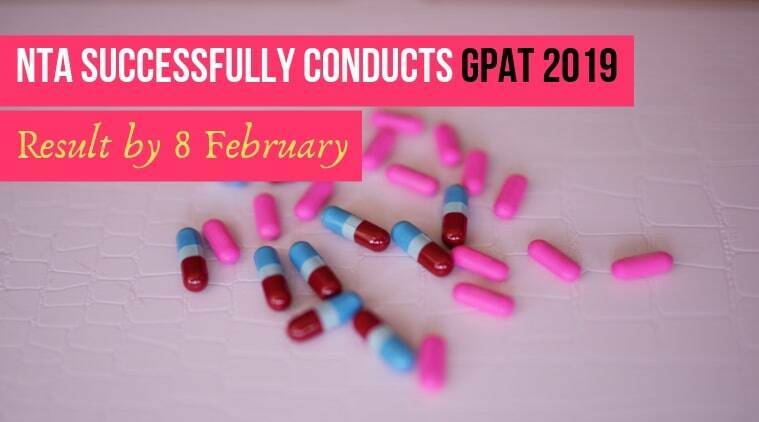 The result of Graduate Pharmacy Aptitude Test (GPAT) 2019 will be announced by February 8, 2019. Students can seek admission to 800 pharmacy institutes in India on basis of its result. Candidates must keep their login credentials roll number, application number, date of birth, password ready to check result. GPAT 2019 answer key along with recorded responses shall be published at official website ntagpat.nic.in shortly after the exam. Candidates can challenge them by paying Rs 1000 per question they wish to challenge. Based on candidate challenges, NTA shall draw a final answer key. Candidates will be evaluated on basis of final answer key. Result of GPAT 2019 shall be published online. Candidates will be able to log-in at ntagpat.nic.in to download their scorecard. GPAT score card will be valid for 3 years. Graduate Pharmacy Aptitude Test was held as a computer-based test of 3 hours duration. There were 125 multiple choice questions in it. Candidates are awarded +4 marks for the correct answer, and 1 mark is deducted for incorrect answer. Prior to the exam, exam day advisories were issued. Candidates were asked to carry officially issued admit card along with passport size photograph, valid photo ID proof. Diabetic students were allowed to take sugar tablets, fruits, transparent water bottle. In order to get M.Pharma admission through GPAT 2019, candidates need to separately apply for admission in participating institutes. In addition to admission, GPAT scores are also used to offer scholarships. It was recently reported that the amount spent in scholarships of Post Graduate candidates such as GATE and GPAT have decreased from 2016-17 to 2017-18 sessions. In the larger picture also, spendings in 9 of 21 central scholarship/fellowship schemes have gone down at the same time. The same was confirmed by HRD Minister as a response to a question in the Rajya Sabha this year. Students who hold a bachelors degree in pharmacy appear in GPAT to seek admission in M.Pharma. Until last year, the exam was conducted by AICTE. This is the first year when newly established NTA took over responsibilities of the exam. National Testing Agency has, since its inception, conducted UGC NET (National Eligibility Test for Junior Research Fellowship, Assistant Professorship), JEE Main 2019 January (for UG engineering and architecture admission). On the same day as GPAT, NTA is also conducting Common Management Admission Test (CMAT) 2019.